In this post I share a review of our first quarter in 2019, in terms of our content, community, team, events and client projects. This post comes as a reflection on the five intentions for 2019 that I published in January. I’d categorise these first three months as a ‘slow season’ in terms of new client opportunities. Yet, writing this post made me realise that we put that quiet time to good use! This is the first time I openly share progress from our behind the scenes. I would love to hear from you whether you find this type of post interesting. We plan to publish our first annual report at the end of 2019. So I’m hoping that these types of posts will come in handy. So without further ado, what have we been doing these past three months? At the end of last month, I was invited on a podcast series entitled ‘The Business of Engineering’ with the team at element14. One of their questions was how many resources do we allocate for social media advertising and promotion. My answer was that I don’t spend money advertising on social media, but rather I invest in people that can create purposeful content for our channels. We have people in our team who help with this and make sure the content we create adds value to our audience. Whether it’s helping to publish the content on the blog, contributing with written content, or crafting engaging tweets, our mantra is to be purposeful about the content we put out there for our community. I’m proud to say that these efforts have been noticed and appreciated by our community. First, we’re receiving comments from previous and potential new collaborators about the value they got from our blog posts. Second, we have been consistent with publishing content, publishing regular blogs once a week and refining our process of creating, editing and publishing content. For me this is a massive win as consistency is something I’ve struggled with in the past. Lastly, our Twitter community has grown and we are very close to reaching 500 friends! Our efforts to reach out to new academic researchers have been consistent and have generated positive interest in what we do. We have reached out to nearly 40 Leeds-based authors in The Conversation asking for insights and tips on communicating research. Beyond raising awareness of our organisation, we have also received invaluable insights. In fact, we shared five communication tips for academic researchers at the beginning of March. This blog post has received a lot of attention on social media and represents the starting point for building a relationship with these researchers. We have also continued to share our Guide to Communicating Research Beyond Academia, asking for feedback on its content from those who received it. We are pleased to have sponsored the Women’s Budget Group with five copies and to have received over 20 positive testimonials on the guide so far. We are planning to share the feedback in an upcoming blogpost. 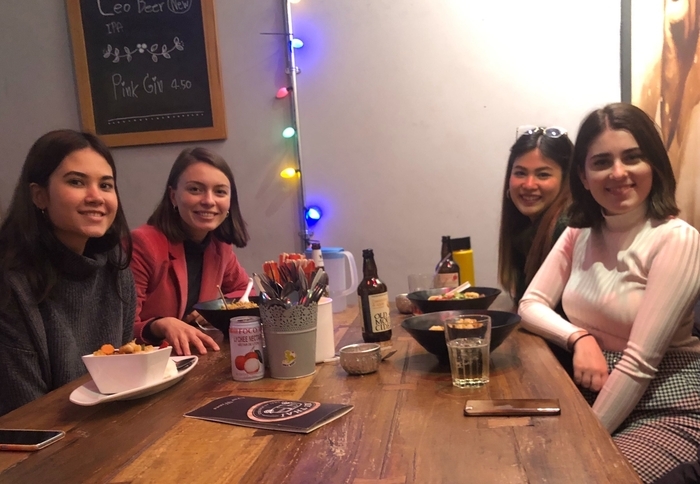 As promised, in March we kicked off our second internship programme, with the lovely Leyla as Social Media Marketing Executive, and Carmen as our Public Engagement Officer. Moreover, in March we also hired our first employee, Isabel, who was our previous intern, to be our Business Development and Operations Assistant. It’s been a really exciting time for growth and I’m learning a great deal about team-building. As the complexity of our work increases, we stay on track with tasks using Trello, a fantastic project management tool. I’ve written about this tool before, and how we use Trello to communicate research. Have a read! At the beginning of the year, I set a resolution to seek out new public speaking opportunities, to get out of my comfort zone and develop new skills. A fantastic speaking opportunity for me this year was being a guest on the Business Live radio show with Jamie Veitch in February. It was a great experience and if you’re curious you can find out five things I learned from being on the radio for the first time. Looking ahead, we have an exciting calendar of speaking opportunities over the next quarter. We are putting on our first ever event in collaboration with Dotkumo about ‘Fake news and disinformation based on a much-publicised government report. We wrote an entire blog post about the event and how it came about, and if you want to join, grab your free ticket! The aim of this workshop is to offer an easy framework for early career researchers to create their own 2-page visual summary and showcase your expertise. I will give a short presentation to an audience of data visualisation aficionados about the Lean Research Canvas tool that we use to kickstarts every Research Retold collaborations. This tool offers a snapshot of the research project and communication objectives. guides our work and helps us stay focused. This will be an interactive session about making research findings more accessible and digestible. I will encourage the participants to share their insights through questions and exercises that will make them excited about their research and how it can reach those who can do something about it. The aim of this workshop is to help early career researchers to think through the communication options and tools available to them, and to help them start a communication plan that suits their research aims and objectives. We also have an internal calendar of events, that we constantly update with relevant events for our industry. This would not be a complete review of our first quarter in 2019 without covering what new client opportunities have come our way. We are delighted to have added five new clients to our portfolio this year so far. We are now an approved supplier of the University of Manchester and the University of Bristol, delivering two really exciting projects for researchers there. We are also working with the University of Warwick, the University of Sheffield and the University of Leeds. We look forward to sharing upcoming projects in future posts! 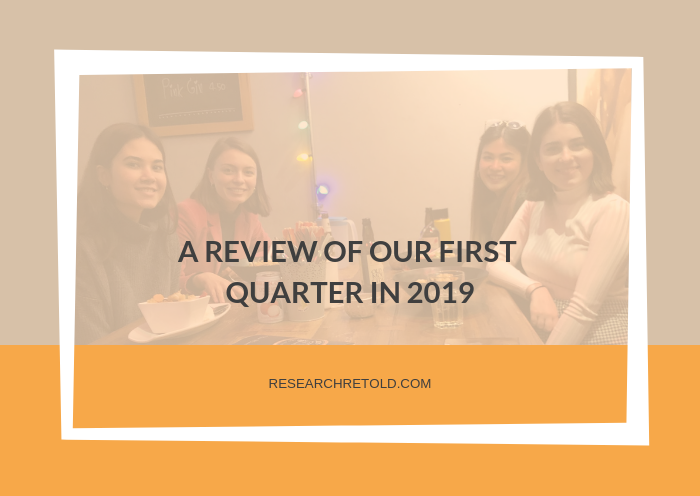 I hope you enjoyed reading about the review of our first quarter in 2019. How were the first three month of your year so far?